Mitsubishi Hitachi Power Systems, Ltd (MHPS) has received a full-turnkey order from Taiwan Power Company (Taipower), a publicly owned electric power provider in Taiwan, for refurbishment of equipment at two gas fuelled combined cycle power plants: Nanpu in Kaohsiung; and Datan in Taoyuan. The contract calls for low-NOx combustor and performance enhancement of seven M501F gas turbines previously delivered by MHPS to Taipower, as well as supply of spare parts. Operator support will also be enhanced through the introduction of MHPS-TOMONITM the digital solutions service offered by MHPS. The refurbishment activities are scheduled for completion in August 2019. The Nanpu plant has a single unit, delivered in 2003, with a generating capacity of approximately 250 MW. The Datan plant has six units (two trains), delivered in 2005 (Stage-I), with a total generation capacity close to 1400 MW. Both plants have contributed significantly to Taiwan’s power supply since going on-stream. The refurbishment project will be carried out jointly with Mitsubishi Corporation. Refurbishment at both plants will centre on replacement of combustors with MHPS’ new FMk8 model developed for low-NOx performance, which reduces NOx emissions by about 60%. Performance enhancement will target increased generation capacity and higher efficiency mainly through upgrading of the turbine blades. At both plants, MHPS will be responsible for the design, manufacture, procurement, installation and test operation of the upgraded equipment. Power supply in Taiwan today is consistently tight, with supply unable to keep pace and the country aspires to increase its capacity reserve margin. Simultaneously, however, measures for reducing environmental impacts are demanded, spurring calls for high efficiency generation facilities which also achieve low NOx. 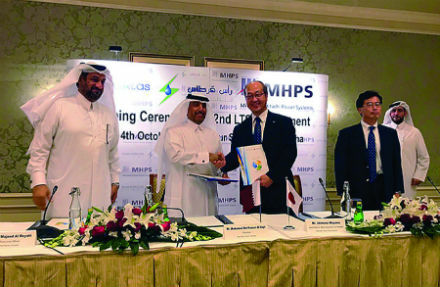 Mitsubishi Hitachi Power Systems has concluded a second long-term service agreement (LTSA) for the Ras Laffan C independent water and power project (IWPP) in Ras Laffan Industrial City, Qatar, covering eight MHPS M701F gas turbines currently in operation at the combined cycle power generation facility. The contract period will be 15 years, starting from 2019. The power generating facilities were ordered in 2008. The plant has a total generating capacity of 2730 MW, and is used to power a desalination plant with the capacity to produce 63 million gallons (approximately 240 000 kl) of fresh water per day from seawater. MHPS has handled maintenance for the gas turbines under the LTSA since the plant began operation in 2010, and concluded the second LTSA as the first came up for renewal. This second LTSA contract was concluded with Ras Girtas Power Company (RGPC), based on a positive assessment of MHPS’ maintenance capabilities in fulfilling the first LTSA. MHPS will continue to provide such services as spare parts supply, repairs, routine inspections and remote monitoring of the operating status.